Easter is just a hippity hop away! 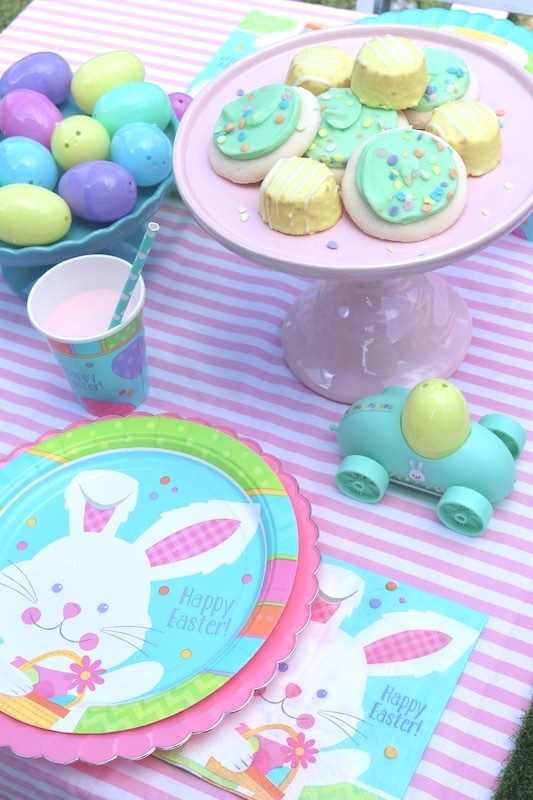 Are you ready to celebrate all things eggs, sweet treats, and cute bunnies? 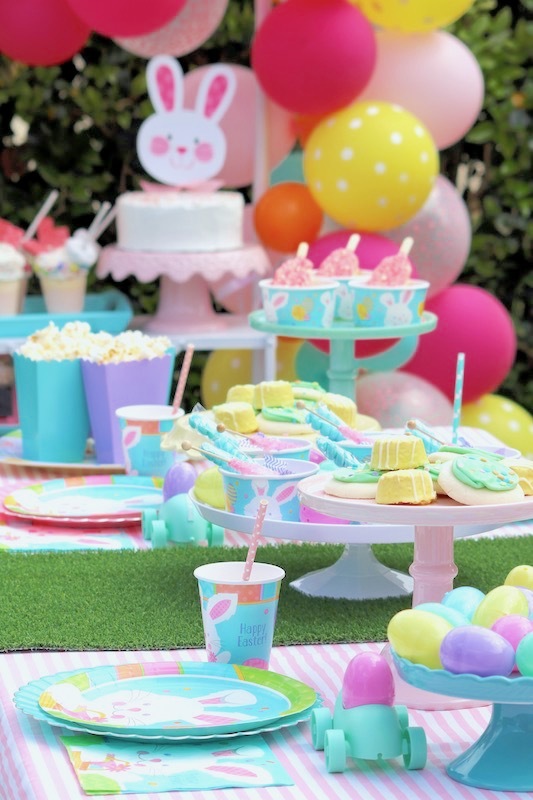 We've got some fun party ideas to share! From balloons, to candies, and cute Easter themed party goods, Party City has everything you need! Start creating a super festive Easter table by adding Hippity Hop Easter Bunny party supplies - you'll find themed plates, cups, napkins, treat cups, and more. 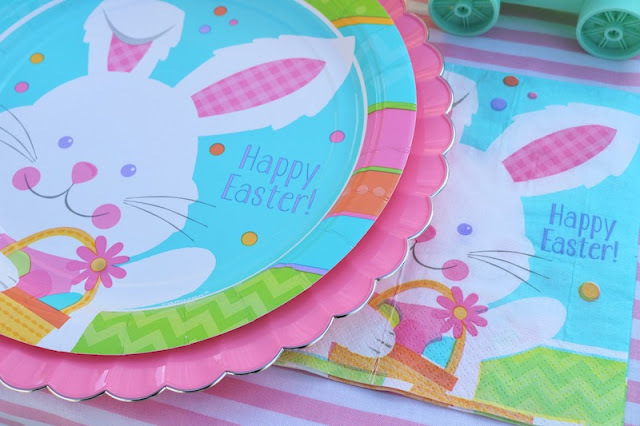 For a fun touch, add Premium Scalloped dinner plates in pink and robin's egg blue, under each place setting. 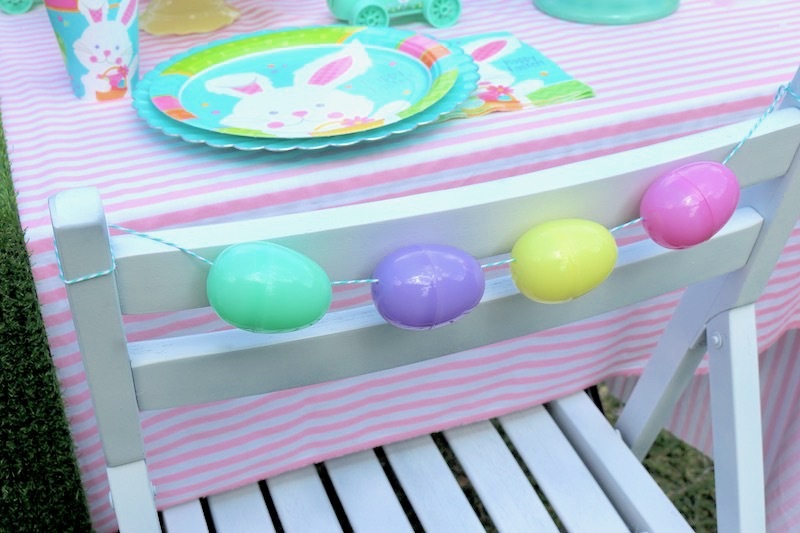 Suspend pink paper lanterns and mini Caribbean blue polka dotted lanterns above the table. 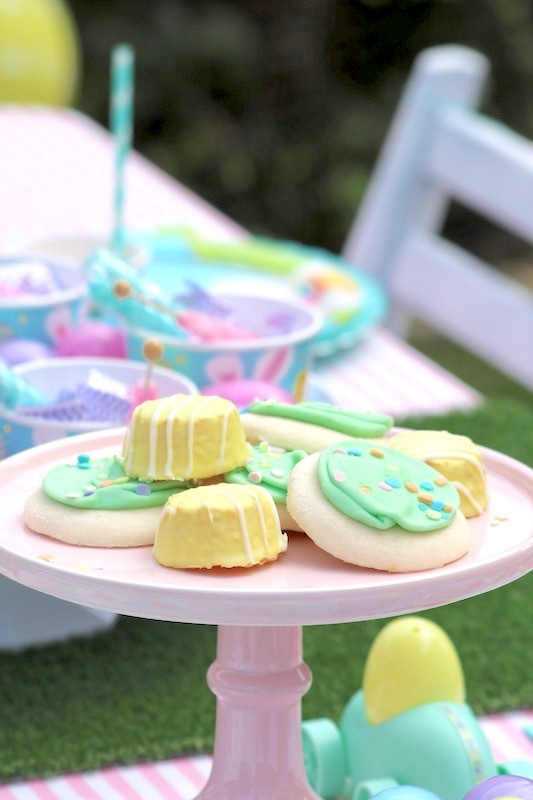 Adding a green grass runner will be another fun addition to your Easter party table. 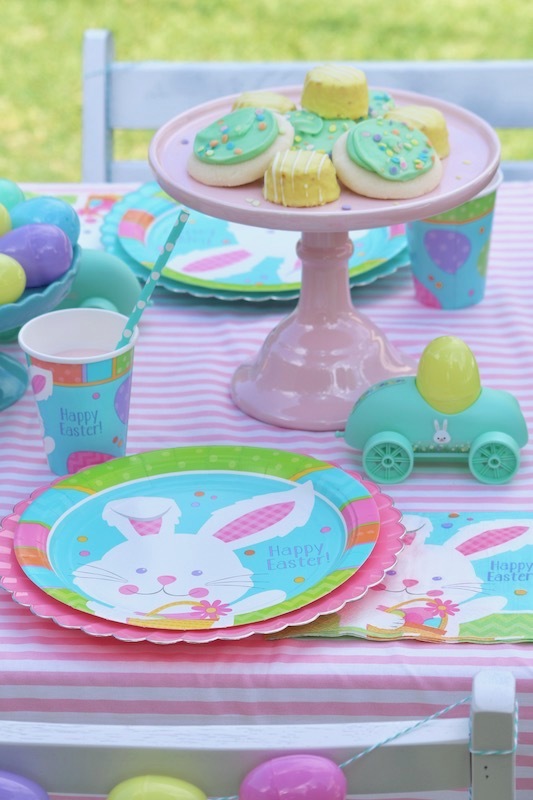 Set out a darling Easter egg car kit at each place setting. 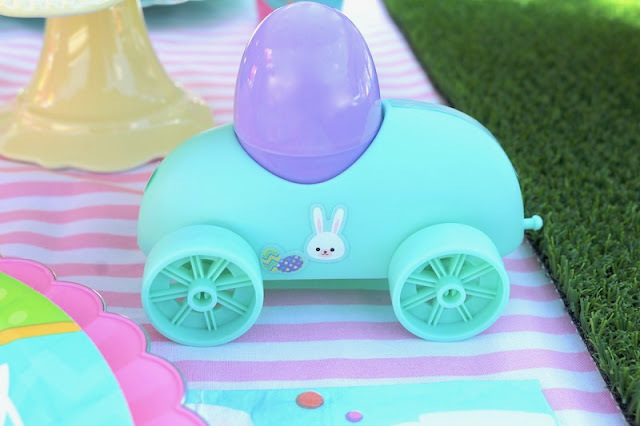 Your little guests will enjoy decorating their car with stickers! 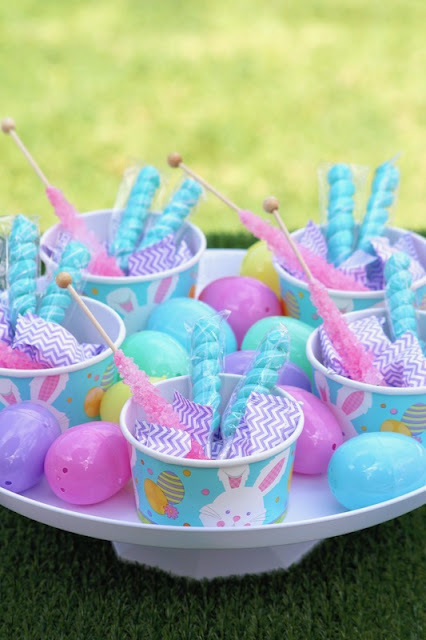 Fill Hippity Hop treat cups with pink rock candy, twisty pops, and mints. 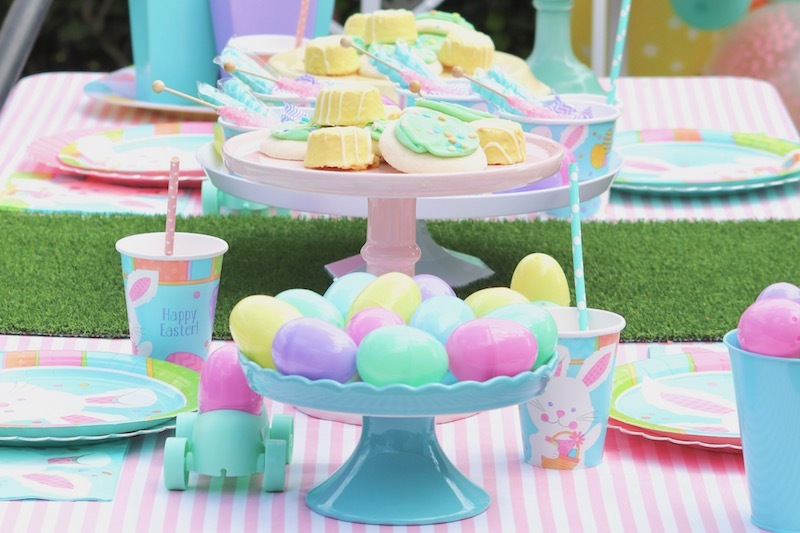 Display them on a plastic cake stand, and add colorful fillable Easter eggs to create a sweet & tasty centerpiece! 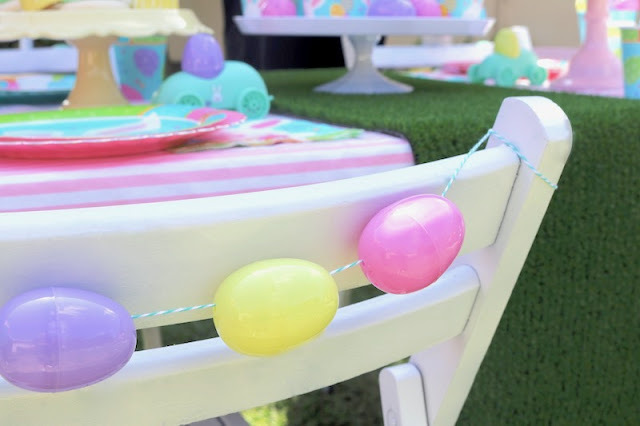 You can also create a sweet little chair decoration by stringing a few plastic Easter eggs together with twine. 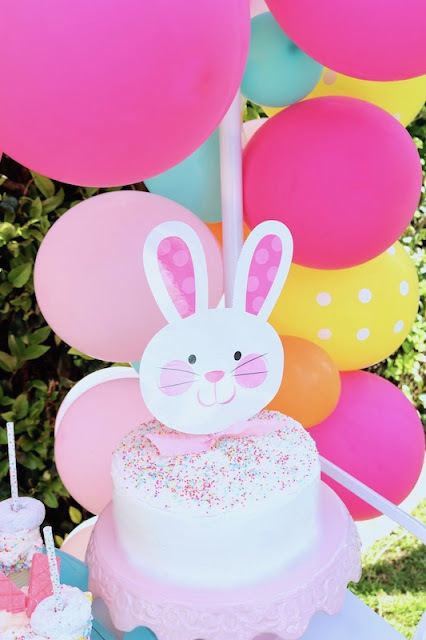 Take a store-bought cake and make it extra sweet by adding coordinating sprinkles and this darling Easter Bunny cutout. 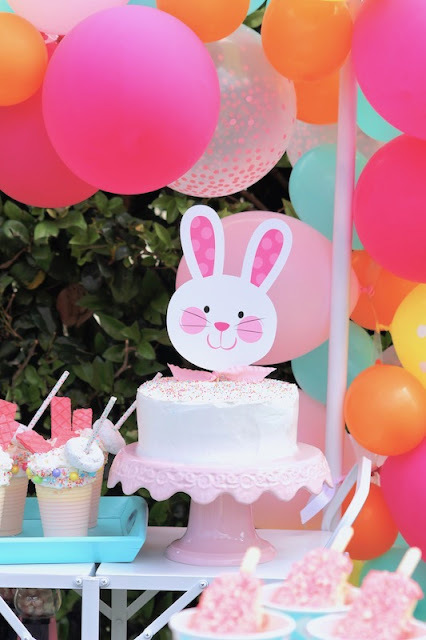 Attach the cutout to a wooden skewer, tie on a bow, and your cake is party ready! Need more sweet treat ideas? 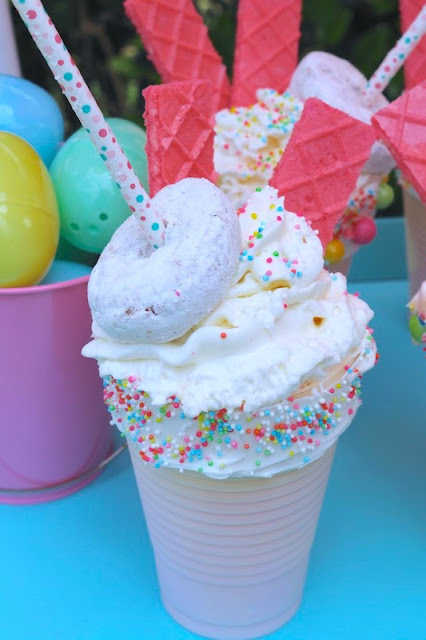 How about a bunny milkshake?! 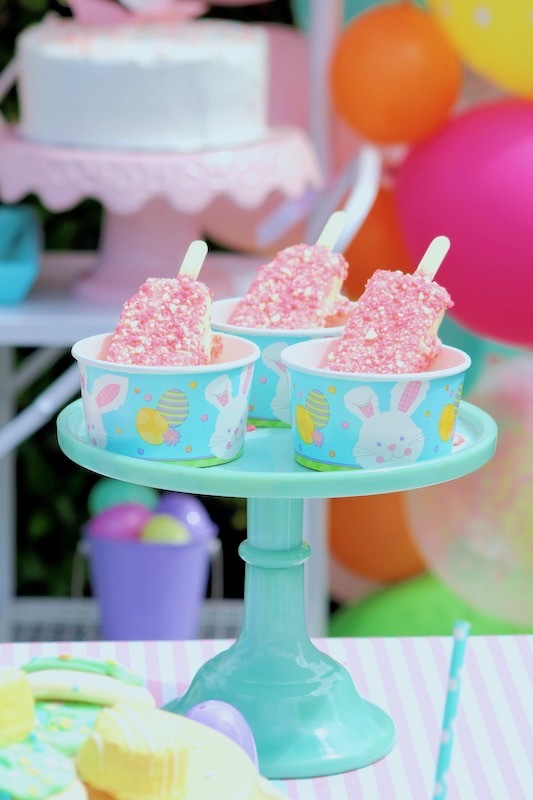 Not only are they super simple to make, your guests will love creating their very own cute concoction! 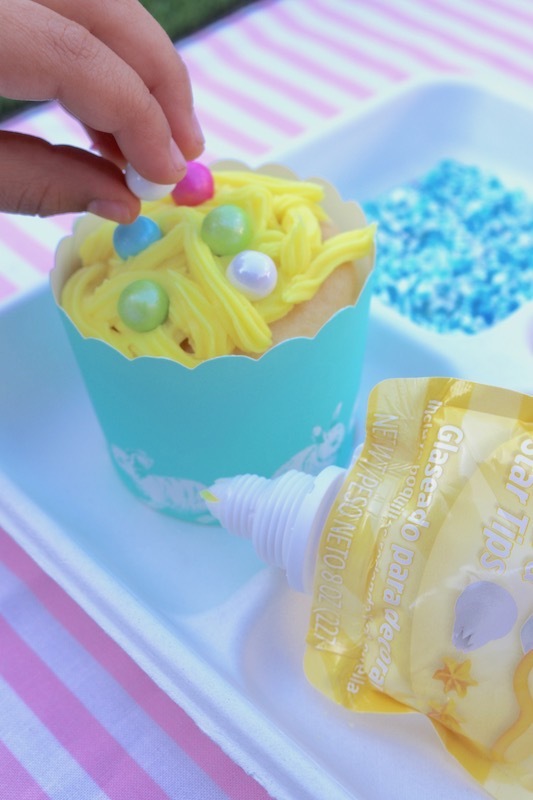 Take 12oz plastic cups and spread the outer rim with frosting. 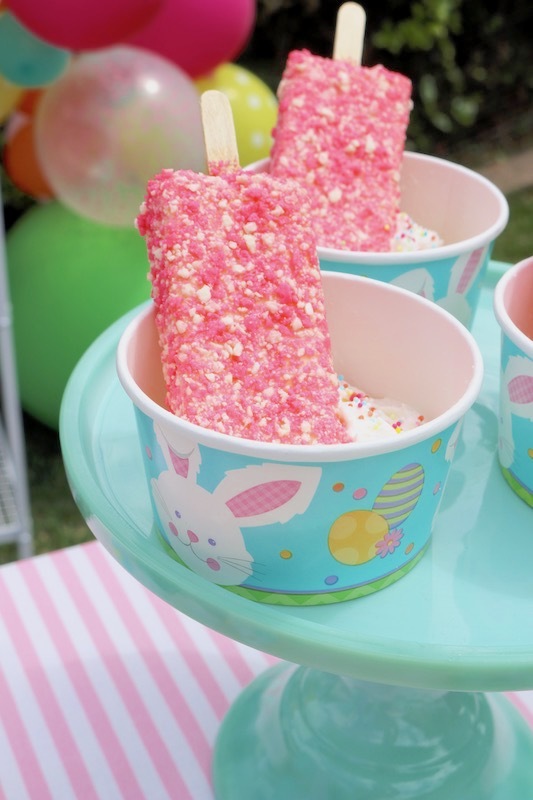 Immediately add sprinkles and fill the cup with ice cream. We used vanilla ice cream and then poured strawberry milk over the top, until it almost overflowed! 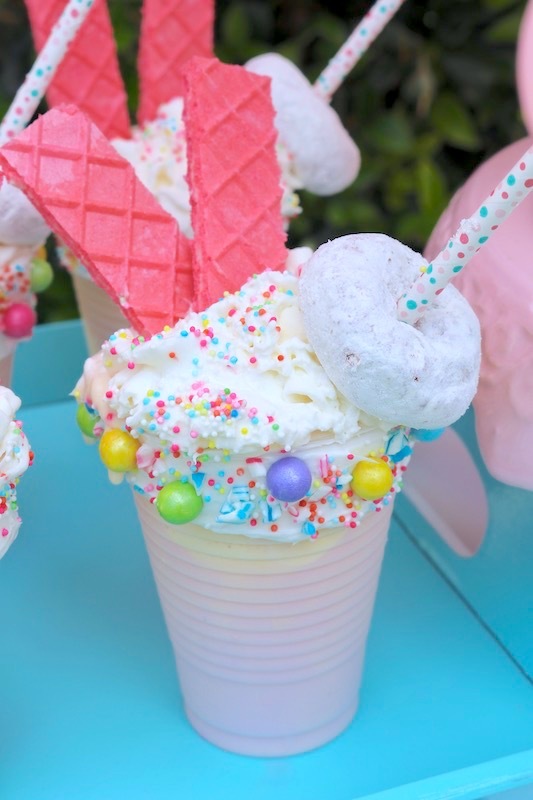 Add a few fluffy swirls of whipped cream, more sprinkles, a fun straw, donuts & cookies, and you're ready to feast on your very own bunny milkshake! 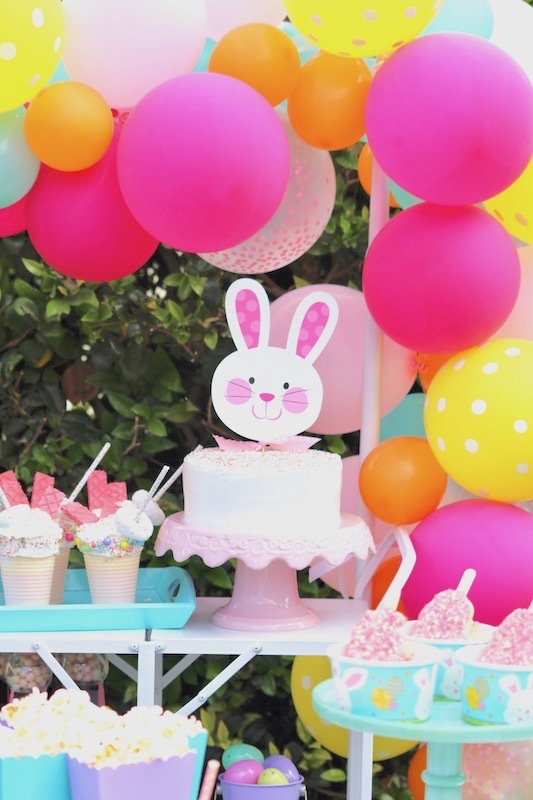 Before we move on to party activities, lets talk about this darling balloon garland! 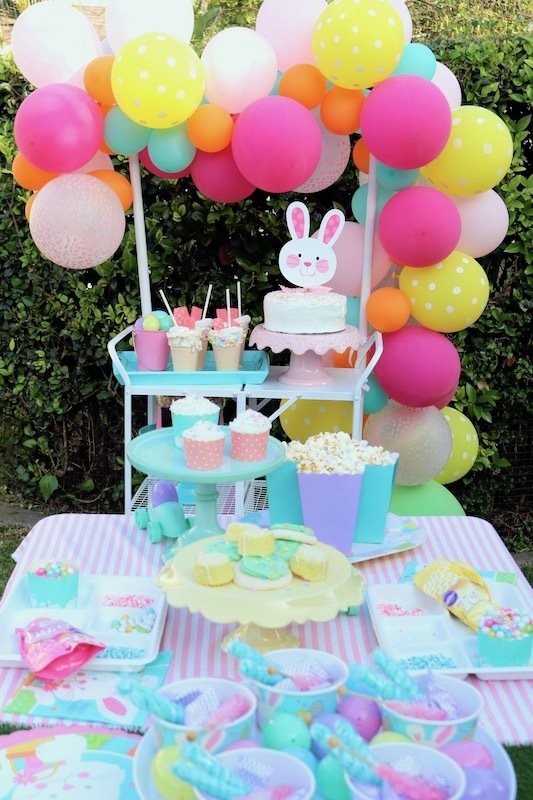 Balloons are one of the easiest ways to bring your party to life, and right now, balloon garlands are all the rage! 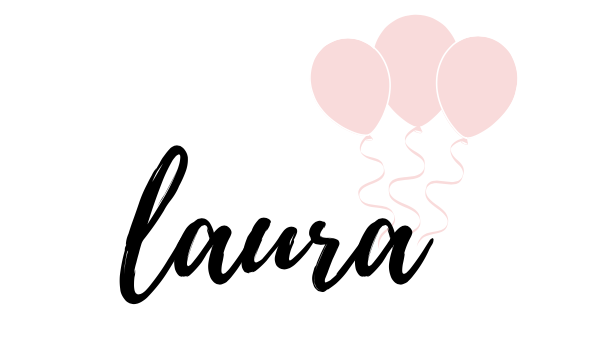 They are a lot of fun, and surprisingly very easy to create - the hardest part is trying to figure out what color balloons you'd like to use. 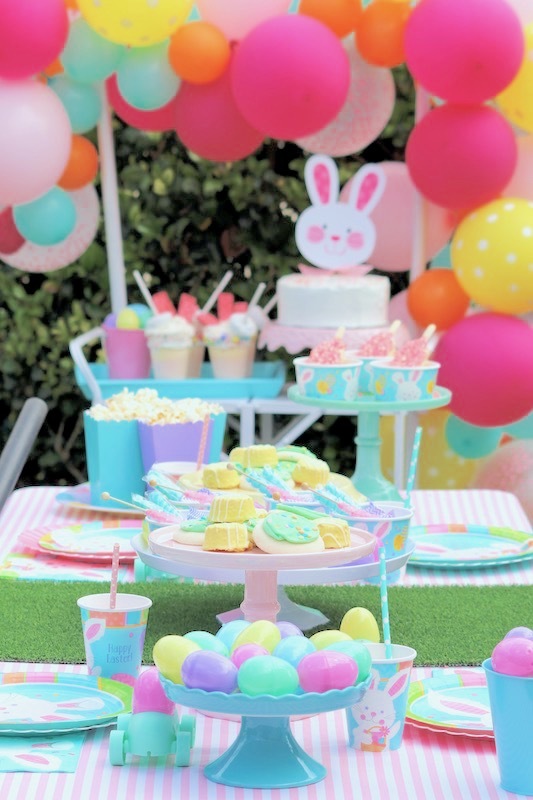 For our Hippity Hop balloon garland, I used yellow polka dot balloons, light pink balloons, transparent pink dot balloons, bright pink balloons, orange mini balloons, and robin's egg blue mini balloons. Don't forget the balloon arch decorating strip! You'll need it to attach all the balloons. Inflating the balloons was a breeze, using an electric balloon pump. Get your guests involved in a couple fun party activities! 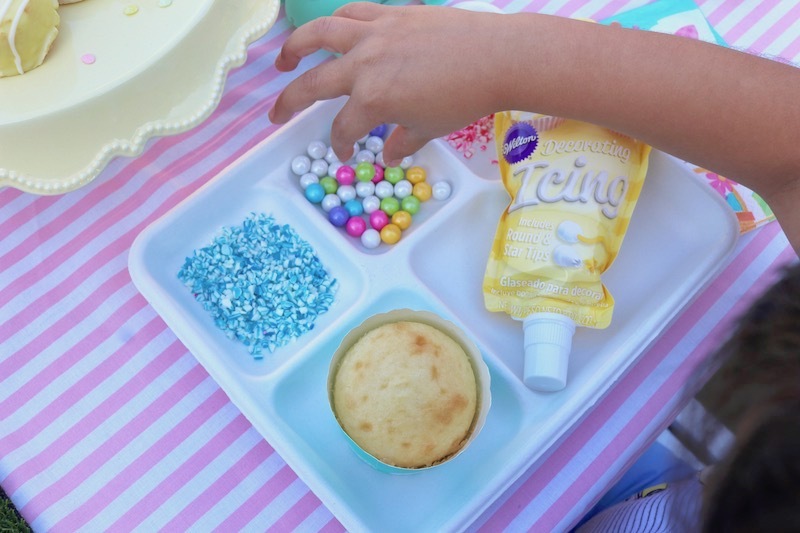 Decorating cupcakes is a great way to keep them entertained. 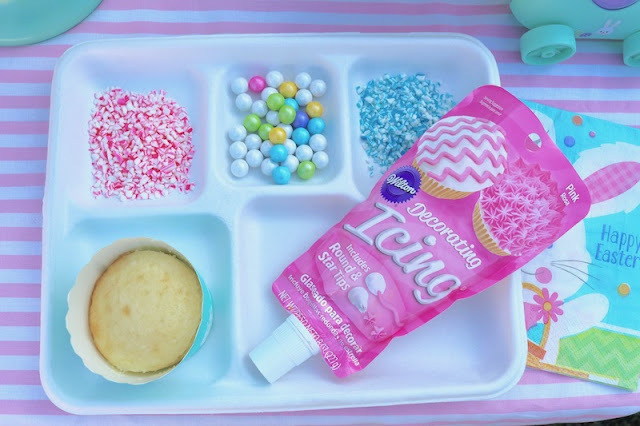 I used a compartment tray from Chinet, and filled it with pink candy crumbles, blue candy crumbles, white shimmer sixlets, and Wilton icing pouches. 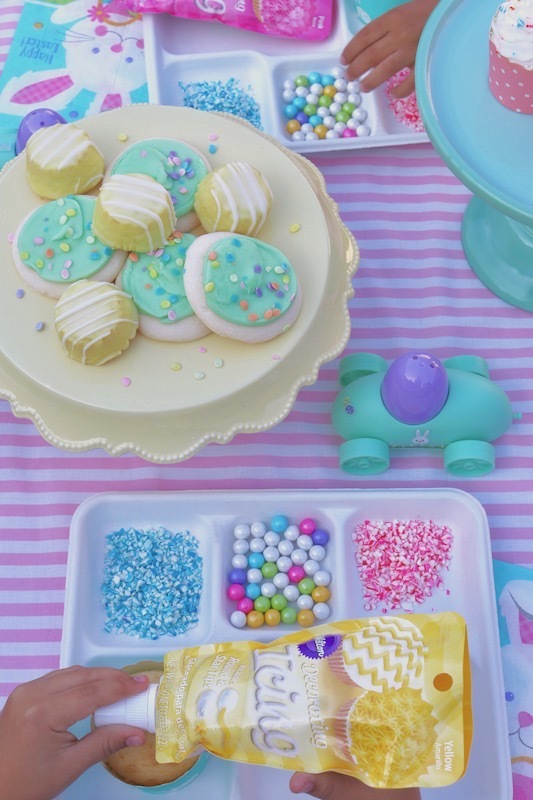 The trays were so perfect for the activity! They're sturdy and just the right size for your table. After your guests are finished frosting their cupcakes, an Easter egg hunt would be the perfect game to gather your guests and play in the yard! 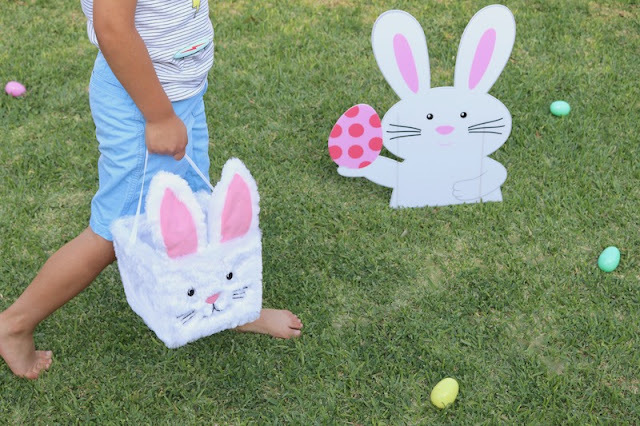 Set out some cute Easter Bunny & Egg yard stakes, and start hunting! 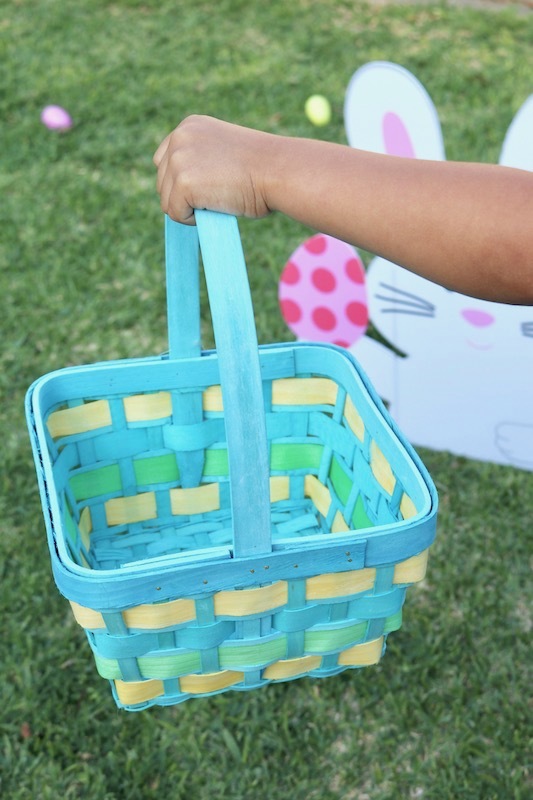 Collect all the Easter eggs in darling Easter baskets - the plush Easter bunny basket, and the medium blue Easter basket were a huge hit! 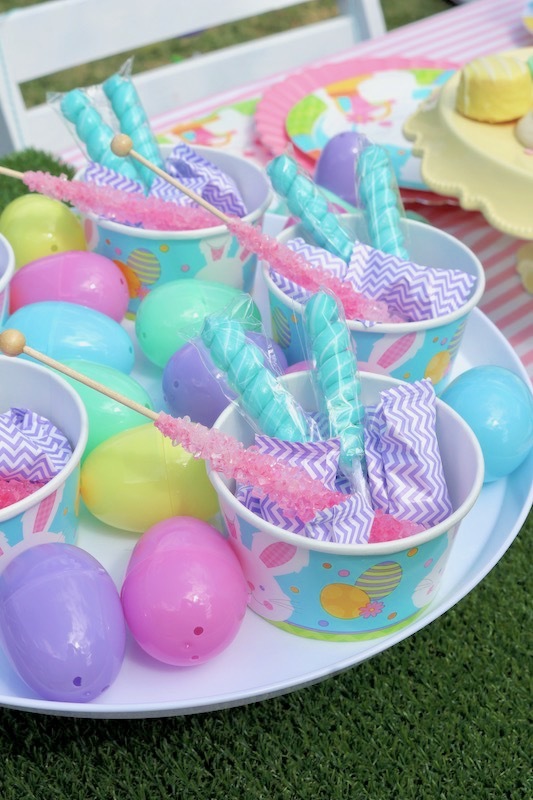 I hope you've gathered some fun and easy ideas for putting together your own Easter party! Party City is a great source for all your Easter party needs. Here's a pin to save to your Easter party ideas board. Happy Easter! 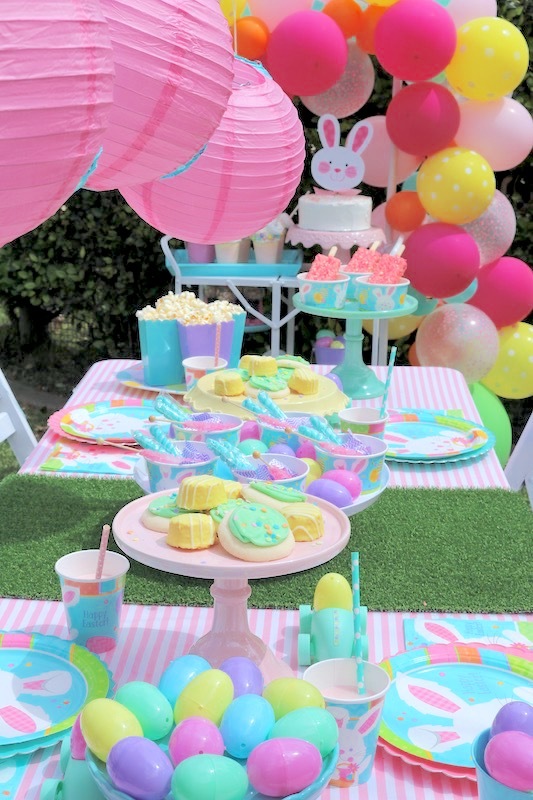 Such an adorable and festive Easter party!! Wow! What a gorgeous party! 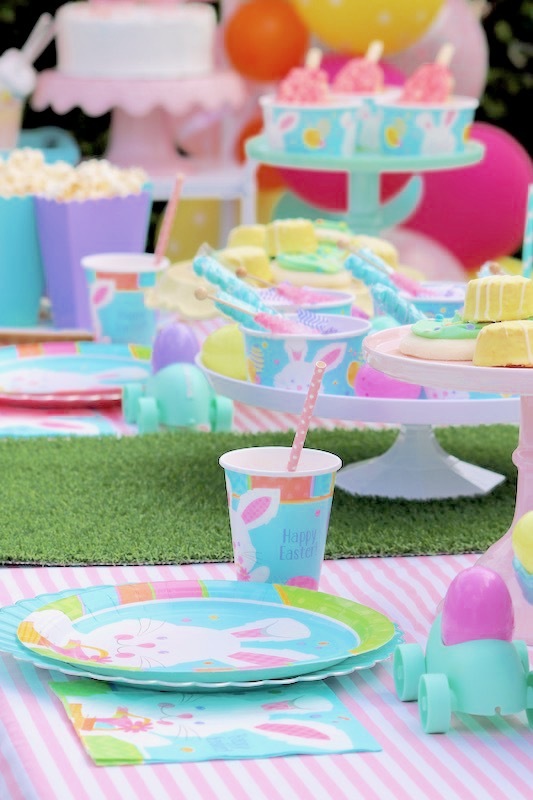 Love the pastels, and OMG those milkshakes! 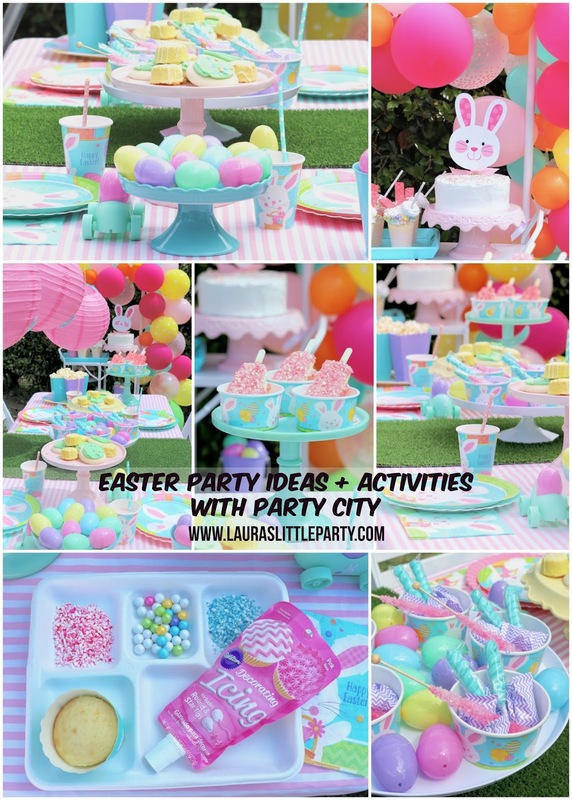 Your parties always look soooo fun, Laura!